I had my very first plate of chicken and waffles at a restaurant called Roscoe's in Los Angeles. My friends had raved about it, and I thought it sounded good and unique to give it a try. It wasn't until about 10 years later when I had my second chance to try chicken and waffles, at a restaurant known as Lo-Lo's in Phoenix, Arizona. What is fried chicken and waffles? It's exactly as you think; it's a big giant waffle topped with a huge piece (or pieces) of fried chicken. The waffle normally comes served with a big ball of fluffy butter on top and a side dish of sweet maple syrup. The chicken, is of course, deep-fried to a crisp, and salty. Served together, a piece of fried chicken and a sweet waffle is one of those sweet and salty combinations that can be so pleasing on the taste buds. It's not that much different from eating a fried chicken sandwich, with a little sweet syrup on it. 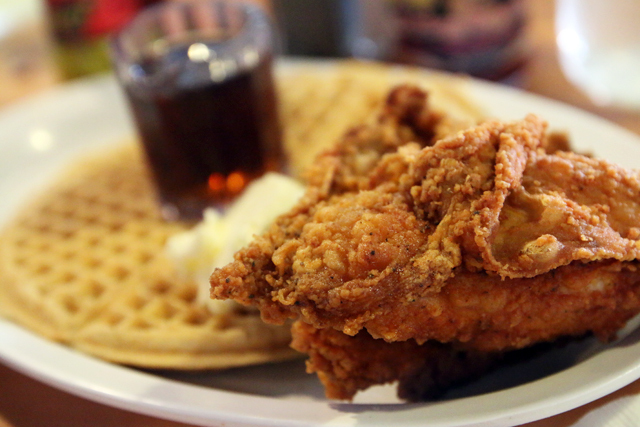 There's a bit of a debate where exactly the combination of eating fried chicken and waffles originated. Some say it was originally started in the southeastern part of the US, where fried chicken is nearly an everyday meal, and sweet breads, like waffles, are also typical. Others say it stemmed from Dutch influenced areas of the US, such as Pennsylvania, where waffles with chicken and gravy have been popular for years. To eat the dish, you can either choose to eat the waffle the traditional way by cutting off pieces with a fork and alternating bites of chicken, or by using the taco method, tearing off pieces of waffle and wrapping up pieces of fried chicken into little tacos. 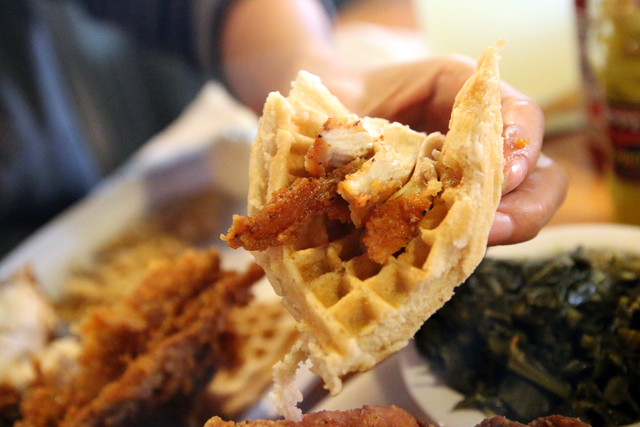 Well, I'm going to have to let you be the judge when you taste your first plate of chicken and waffles. I personally didn't grow up eating waffles, so I'm overall not a huge fan of waffles (or really any kinds of breads, I'm a rice man). That being said, I do love a good piece of fresh fried chicken, when it's real chicken (not the fake tasting, overly soft fast food variety), and at restaurants serving this combo, they usually make no mistakes with the southern style fried chicken. Also, as a lover of Thai food, I'm a huge fan of combining sweet and salty to complement each other, but I also need some spice with it. So for me personally, I liked it a lot, but I preferred the fried chicken doused in Louisiana chili sauce, along with the waffle. That was delicious. Nowadays, most of the restaurants that serve chicken and waffles consider themselves soul food restaurants – the comfort style food popular especially in the southeastern United States. 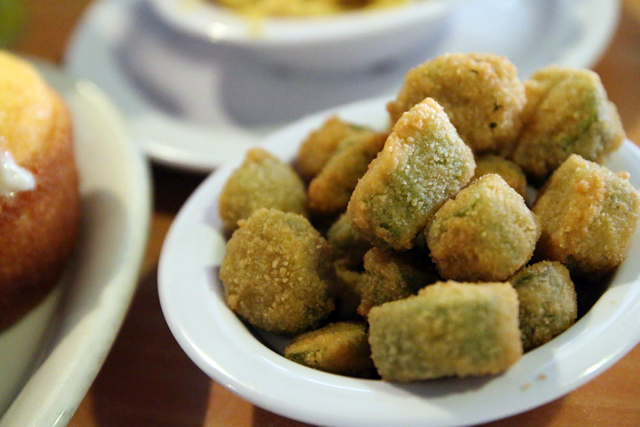 Along with serving fried chicken and waffles, often the restaurant will also have a full menu of traditional southeastern American dishes like collard greens, corn bread, fried okra, or macaroni and cheese. There are no specific time that chicken and waffles should or can be eaten. Breakfast, lunch, dinner, or even snack, are all acceptable times. It's sort of the type of meal you need to get a craving for, be in the right mood to eat, and then you head straight to the nearest chicken and waffles restaurant and satisfy that craving for sweet and salty chicken and waffles! I’ve had many different plates of Chicken and Waffles all around the country each with their own spin on it. I can definitely say that it is a very unique dish and I’m glad somebody invented it! We definitely love to eat chicken and we definitely love to eat waffles. You got us really hungry there!